This heartfelt homage to two-wheeled culture is geared toward bike lovers. Geared toward bike lovers, this print is a heartfelt homage to two-wheeled culture. Florent Bodart formed an abstract heart from an array of bicycle parts, digitally printed in red or black on ready-to-hang canvas. 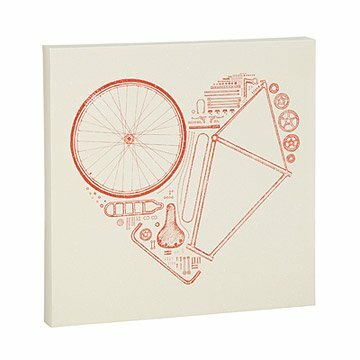 It makes a sweet gift for bike geeks and romantic road riders. Made in Colorado. Growing up surrounded by artists and violin makers, Florent Bodart naturally became a creator himself. He started his career designing T-shirts, and now works on a large pallet of graphic design projects, from apparel to illustration. His creative process usually includes drawing time and experimenting in the physical world before switching to the magical, digital world. Add craft and music into the mix and you have the formula for what makes Florent’s work complete and brings his life a sense of balance.